DAYLESFORD, Australia, 1 March, 2017 – It is already clearly apparent, as many predicted, that Donald Trump’s election as president of the United States would signal the start of what might be the final monumental assault on much of what is good in our world. Whatever our collective gains to date to create a world in which peace, social justice and environmental sustainability ultimately prevail for all of Earth’s inhabitants, we stand to lose it all in the catastrophic sequence of events that Trump is now initiating with those who share his delusional worldview. Starting with the appointment to his administration of individuals, such as Steve Bannon, Rex Tillerson and Scott Pruitt, who share his warped view of the world, and continuing with the policy decisions he is now implementing via executive orders, Trump threatens our biosphere with ecological catastrophe (through climate/environment-destroying decisions and perhaps through nuclear war) – see ‘US election: Climate scientists react to Donald Trump’s victory‘ and ‘It is two and a half minutes to midnight: 2017 Doomsday Clock Statement‘ as well as ‘Trump pledges “greatest military build-up in American history“‘ – exacerbates military violence in existing war zones – see ‘Obama Killed a 16-Year-Old American in Yemen. Trump Just Killed His 8-Year-Old Sister‘ – increases regional geopolitical tensions in ways that inflame the possibility of political unrest and military violence in new theatres – see ‘Worried Over Trump, China Tries to Catch up With U.S. Navy‘ – supports violent and repressive regimes against those who struggle for liberation – see ‘The Middle East “peace process” was a myth. Donald Trump ended it‘ – and is generally implementing decisions that reverse progressive outcomes from years of peace, social justice and environmental struggles. See, for example, ‘Trump’s Immigration Crackdown Is Likely to Bring a Flood of Lawsuits‘ and ‘One of Donald Trump’s first moves in the White House strips women of abortion rights‘ as well as ‘President Trump Breaks a Promise on Transgender Rights‘. Moreover, Trump, and those like him, further criminalize our right to dissent. See ‘North Dakota Senate passes bills criminalizing Dakota Access Pipeline protests‘. Why does Trump ignore overwhelming scientific evidence (for example, in relation to the climate) and want to ‘lock out’ people who are desperate to improve their lives? Why does he want to prepare for and threaten more war and even nuclear war? According to Dr John D. Gartner, a practising psychotherapist who taught psychiatric residents at Johns Hopkins University Medical School, ‘Donald Trump is dangerously mentally ill and temperamentally incapable of being president’. See ‘Temperament Tantrum: Some say President Donald Trump’s personality isn’t just flawed, it’s dangerous‘. 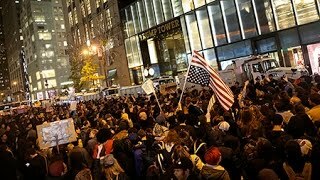 Moreover, Chris Hedges argues, Trump is dangerously violent. See ‘Trump Will Crush Dissent With Even Greater Violence and Savagery‘. But why is Trump ‘dangerously mentally ill’ and violent? For the same reason that any person, whether in the Trump administration or not, ends up in this state: it is an outcome of the ‘visible’, ‘invisible’ and ‘utterly invisible’ violence that they suffered during childhood and which unconsciously determines virtually everything they now do. In brief, Trump is utterly terrified and full of self-hatred but projects this as terror and hatred of women, migrants, Muslims… and this makes him behave insanely. For a brief explanation, see ‘The Global Elite is Insane‘. For a more comprehensive explanation of why many human beings are violent, see ‘Why Violence?‘ and ‘Fearless Psychology and Fearful Psychology: Principles and Practice‘. So what are we to do? Well, if you are inclined to resist the diabolical actions of Donald Trump (and his insane and violent equivalents in the United States and other countries around the world), I invite you to respond powerfully. This includes maintaining a large measure of empathy for the emotionally damaged individual who is now president of the US (and his many equivalents). It also includes recognizing that this individual and his equivalents are the current ‘face’ of a global system of violence and exploitation built on many long-standing structures that we must systematically dismantle. Here are some options for resisting and rebuilding, depending on your circumstances. If you wish to strike at the core of human violence, consider modifying your treatment of children in accordance with the suggestions in the article ‘My Promise to Children‘. If you wish to simultaneously tackle all military, climate and environmental threats to human existence while rebuilding human societies in ways that enhance individual empowerment and community self-reliance, consider joining those participating in ‘The Flame Tree Project to Save Life on Earth‘. If you wish to resist particular elite initiatives that threaten peace, justice and environmental sustainability, consider planning, organizing and implementing nonviolent strategies to do so. But I wish to emphasize the word ‘strategies’. There is no point taking piecemeal measures or organizing one-off events, no matter how big, to express your concern. If you don’t plan, organize and act strategically, you will have wasted your time and effort on something that has no impact. Remember 15 February 2003? Up to thirty million people in over 600 cities around the world participated in rallies against the war on Iraq in what some labeled ‘the largest protest event in human history’. Did it stop the war? So if you are inclined to respond powerfully by planning a nonviolent strategy for your campaign, you might be interested in the Nonviolent Strategy Wheel and other strategic thinking on this website – Nonviolent Campaign Strategy – or the parallel one: Nonviolent Defense/Liberation Strategy. And if you wish to join the worldwide movement to end violence in all of its forms, you might also be interested in signing the online pledge of ‘The People’s Charter to Create a Nonviolent World‘. Donald Trump has formidable institutional power at his disposal and he and his officials will use it to inflict enormous damage on us and our world in the months ahead. What most people do not realize is that we have vastly greater power at our disposal to stop him and the elite and their institutions he represents. But we need to deploy our power strategically if we are to put this world on a renewed trajectory to peace, justice and sustainability.